It’s enough to strike fear into even the most experienced of marketers and bloggers. It can seem like torture by tedium. It’s often the stuff of nightmares. What is this unholy monster? A well-executed content audit done on an annual basis can deliver big insights into your website’s blog and content marketing strategy that far exceeds its ho-hum reputation. Too often, we post something and then never go back to it again. Years later, it’s outdated, stale, and completely irrelevant. Good practice demands that we return to our content periodically to ensure that everything is as fresh and beautiful as the day it was released to the world. A content audit involves taking a look at all the content on your website and assessing its relative strengths and weaknesses in order to prioritize your future marketing activities. It’s a qualitative assessment and evaluation based on the KPIs (Key Performance Indicators) that you select beforehand. This process should not be confused with a content inventory, which is simply an accounting of all these different assets. In other words, it’s a quantitative collection. Although a content inventory is part of the audit process, the audit itself goes much further in depth. The Content Analysis Tool (CAT) can make content inventories a snap. When you start off on the right foot, the rest of the journey is that much easier. Which ones are performing best? What topics does your audience most connect with? Which posts have overstayed their welcome? An audit will tell you where you need to focus your future efforts in terms of both an SEO and content marketing perspective. And it can even give you insight into potential changes that will improve your lead generation, sales, and marketing processes. 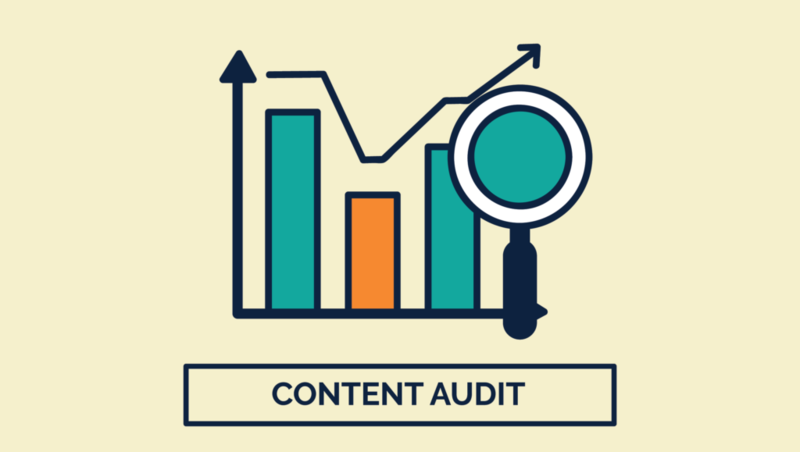 If you’re struggling to understand your visitors’ behavior on your website or why your current marketing initiatives aren’t working, a content audit is easily one of the best things you can do for your business. But before we get into the step-by-step process of conducting one, you need to answer a few questions. 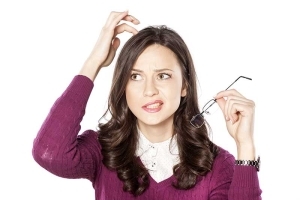 Why Am I Conducting a Content Audit? There could be any number of reasons. There’s no one correct approach for conducting a content audit – the exact steps you’ll take will depend on your reasons for undergoing the process in the first place. SEO – Conducting a content audit for SEO purposes helps you to identify any weak spots in your site’s search engine optimization. By cataloging the different keywords, word counts, optimized images and other elements that are associated with each content asset on your site and comparing them to your current page rankings, you should be able to determine what changes need to be made to improve your site’s natural search performance. And as most traffic coming to your site is from organic search, this is a crucial business exercise that you should be doing at least annually. Content Marketing – Another great reason for performing a content audit is to assess the current status of your content marketing efforts. Instead of looking at page optimization factors, you’ll concentrate on things like page length, visit metrics, and social shares to determine how your audience is responding to each content piece you’ve created (and, consequently, how you could alter your content marketing efforts in the future to improve its performance). Of course, there’s no reason you can’t do both. While you’re digging through your SEO metrics, it’s easy to jot down your content marketing data as well. Or you might be approaching your content audit from a slightly different perspective. Whatever the case may be, being clear about your intentions ahead of time will help to streamline the process and minimize extra effort. Know why you’re doing before you start doing it. What Resources Do I Have Available for My Content Audit? A good content audit is a time-consuming process. If you’re currently swamped with other priorities, undertaking such a massive project may not be the best use of your time or energy. If you can’t devote the proper resources to it, it’s better to wait until you can. But if the project must be done, keep in mind that you do have options. Instead of undertaking the entire audit process by yourself, delegate some of the data-gathering steps to another employee in your organization or to an outsourced worker hired through sites like Guru or Upwork. You also have the option of completing only small sections of the audit at any given time, or paying for tools that help to automate parts of your research process (gone are the days of having to manually sift through everything yourself!). More on this later. What Do I Hope to Get Out of My Content Audit? Before you begin, be clear about the reason you’re conducting a content audit in the first place. If you aren’t going to take action based on the data that your audit produces, you might as well skip the process altogether. An audit for the sake of an audit is a waste of time and resources. Any of the following are potential content audit goals. You may have others that are not on this list, and you’ll likely have more than one in mind as you go through it. That’s the theory. Now let’s put it in practice. 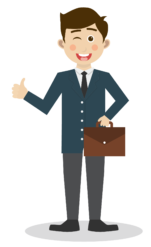 To help illustrate how to do a content audit, we’ve created John, a business owner with a heart of gold. He runs a small software company that’s developed an SaaS budgeting tool. He’s invested in content marketing for about a year, but he isn’t sure whether all the time he’s spent blogging, creating videos, and releasing infographics has paid off. As a result, he decides to conduct a content audit to see how his individual content pieces are performing and what – if anything – he should do differently in the future. Because John only has five employees – all of whom are busy wearing multiple hats already – he decides to take on the audit process by himself. Because he’s a busy guy, he keeps the scope of his audit small, checking only the content he’s created in the past year and tracking only a few variables that indicate success to him. Remember, the size and scope of your audit is completely up to you. This is not an all-or-nothing scenario. Do what you can when you can do it. We’ll revisit John a little later on. Use a crawling tool like Screaming Frog (free for up to 500 URLs) or URL Profiler (paid plans) to identify all the URLs on your existing website and download that data as a CSV file (just hit “Export” after it’s done crawling). These tools are also capable of automatically collecting various other SEO data points for you. Manually enter the URLs into your spreadsheet (you probably don’t want to go this route if you have 2,000+ pages, but a dozen or so is fine). The easiest way to do this is to log into your WordPress dashboard, navigate to Posts > All Posts, and then click on each one in turn to get its URL. Fancy? No. But it does the trick. Content Quality Audit Template – Content Strategy Inc. Most audits use a spreadsheet to organize the data, but it’s not the only way. 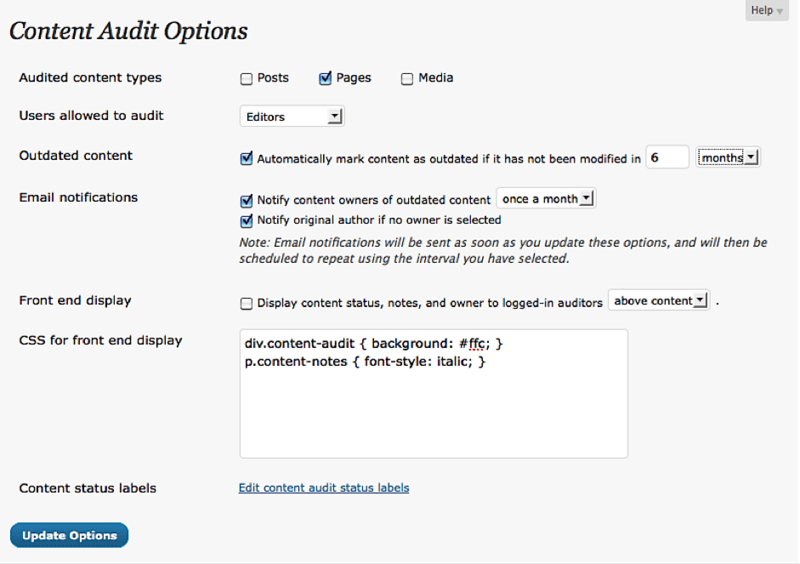 If you despise Excel for some reason (no judgement), you could opt for the WordPress Content Audit plugin. This tool allows you to create a content inventory directly in the Edit screens in WordPress. Set a few conditions, and you’re good to go. Just go with whatever you’re most comfortable with. Set yourself up for success by using the tools and methods that work for you. 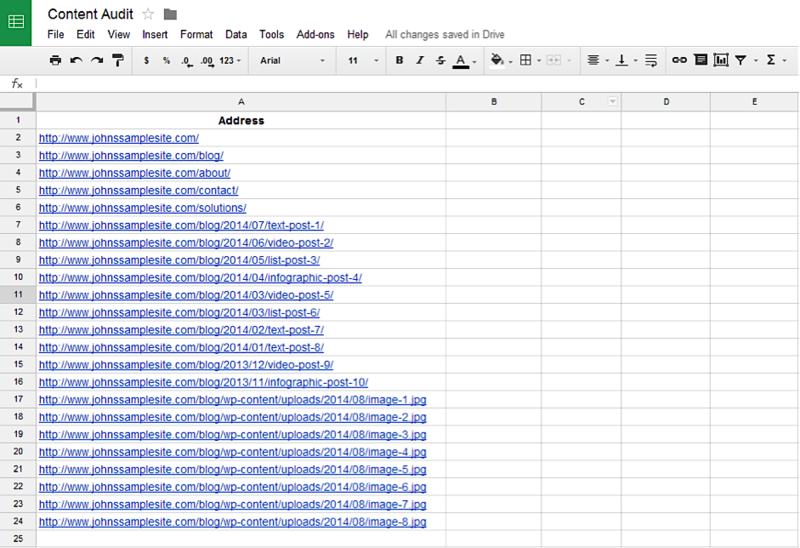 To upload your CSV file into Google Sheets, go to File > Import > Upload and select the saved file from your computer. Easy-peasy. John is well on his way with a handy list of all his URLs. Step 1? Check! Remember those columns I mentioned earlier? Now’s the time to set them up and fill them out. The exact data points you’ll want to gather will, again, depend on the goals of your audit, as well as the complexity you want to achieve. Although the lists below may look daunting, it isn’t necessary to collect data on every possible variable. In fact, you may be able to achieve the goals you set for yourself with only a handful of possible data points. Once you’ve selected the data points you’ll measure as part of your content audit, label a column in your spreadsheet for each one. Now comes the fun part — time to do the heavy lifting of data collection (and yes, “fun” is subjective)! While he could track other pieces of data as part of his audit – and probably glean additional insights from doing so – analyzing only this limited number of metrics makes it possible for John to complete his content audit while juggling his other responsibilities. The way he looks at it, he can always go back and add more to his analysis if he has the time down the road. Screaming Frog gives him the page title tags (and even title tag length…50-60 characters is optimal) for each of the URLs he’s tracking. Google Analytics provides page visit, bounce rate, and average type on page data (check out Reporting > Behaviour > Site Content > All Pages for a great place to start. You can export the data by clicking Export > CSV under the report title, and then import directly into your spreadsheet.). Shared Count gives him the number of times each post has been shared socially (there is a bulk upload feature, but you need to be a paying member to use it. Otherwise, you just enter each URL manually.). Act-On (the marketing automation program John is using) gives him conversion data by page (although he could have opted to use Google Analytics for this if he had goals already set up on that platform). Once John is done gathering this data, he goes back through his list and assigns a score to each page on an “A – F” rating scale of his own creation. Pages that receive “A” scores are his cream-of-the-crop, top-performing pages, while those that earn “F” scores are ones he’s embarrassed to find on his site. He also adds a note to his spreadsheet showing the date that his audit was created for the purpose of planning future audits. And even though John didn’t do this, you could also head over to the Google Search Console to pull even more conveniently organized data. Click on Search Analytics, select Pages, and check Clicks, Impressions, and CTR to get a quick snapshot of how individual pages are performing. There’s a “Download” button at the bottom of the page if you want to export the data as a CSV file and add it to your ever-expanding spreadsheet. If your site is large, expect the data-gathering process to take a long time. It’s not uncommon for audits to take days, weeks or even months to complete, depending on the size of the website and the organizational resources that are available for the process. But even if your content inventory is completed quickly, you’ve still got another important step to take – actually putting all your information to use. To be sure you’re getting something substantive out of your content audit process, you need to establish a set of recommended actions you’ll take once the audit is complete. And in order to do that, you need to dive into the data you’ve collected in order to draw conclusions. Consolidate (assets that are perhaps too short or not meaty enough and would benefit from being combined with another asset). Don’t forget to complete a 301 Redirect for any post that is absorbed into another one so as not to lose any SEO equity it had built up. Unfortunately, there are no hard and fast rules that say, “If your content data indicates [this], do [that].” Instead, you’ve got to look at the data you’ve gathered and see if you can identify any trends that could inform your eventual recommended actions. Visitors stay an average of two times longer on John’s video blog posts than they do on his text posts. This could suggest that John allocate more of his future content creation resources to video production. John’s highest conversion rates appear on the blog posts he publishes with list post titles. As a result, he may want to add more posts like this in the future. Although John’s infographic posts have the most social shares, they have the lowest conversion rates overall. This could suggest a few different things. He could be reaching the wrong people with his social media marketing efforts, the calls to action on his infographics could be weak, or he could be creating infographics on the wrong topics. John will want to dig deeper into each of these possible conclusions and determine whether to change his approach or continue to enjoy the potential SEO advantage that comes from having more social shares. Rewrite or remove all content pages that scored lower than a “C” in his analysis. Spend more time promoting his highest-converting pages on social networking sites. Create four evergreen content pieces that are similar to these highest-converting pages. Commit to publishing at least one new video post a week. Develop more content on the topic of budgeting, relative to other categories. An audit might focus on content quality, the customer experience, content performance, or any combination of these. Use the results of your content audit to come up with 5-10 actions you’ll take after completing it, based on any patterns that emerge from your data. Then, set deadlines for yourself in order to put these actions into play and block out whatever time you’ll need to do so on your calendar. Add a deadline right into your spreadsheet (when it comes to columns, you can never have too many!). One important thing to note here. When you’re staring at the mountains of data your content audit may generate, it’s easy to find yourself struck down by analysis paralysis. Basically, there are so many conclusions you could draw and so many things you could do, that you wind up doing none of them. Don’t let yourself fall into this trap. 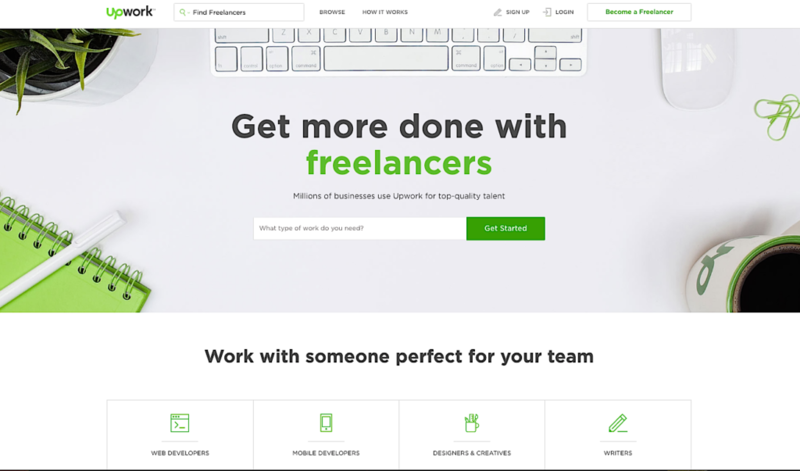 Content marketer Pawel Grabowski offers many helpful suggestions to combat analysis paralysis, such as focus on what’s most important, break decisions down into bite-sized steps, and don’t worry about being perfect! As long as you’re tracking your metrics and regularly revisiting the content audit process, you’ll see these shifts occurring and be able to remedy them long before they become big problems plaguing your site’s performance. If you’ve caught the auditing bug while going through the content analysis process, you can always take the skills you’ve learned to expand your audit beyond the borders of just your website. So now you know everything there is to know about your own content. But unless you have a truly unique product or service, you’re not the only show in town. You have competition for customers. The performance of your content will always be tied, in some ways, to the content that your competitors put out. Even if their pieces don’t directly prevent visitors from seeing yours, there is a limited number of consumers out there and they all have a finite amount of attention. If they’re using all their energy focusing on the competition’s content, they may not have enough mental focus left to pay attention to yours. Conducting an audit of your competitor’s content is similar to assessing your own, but with a few limitations. There are a few metrics that you may not be able to pull without having direct access to your their website and accounts. Bounce rate, average time on page, and conversion rate are three in particular that are difficult to discover without accessing the site’s Google Analytics profile or marketing automation account. But that said, there are still plenty of different things you can track. You can evaluate the number of links pointing at your competitor’s content pages using tools like Majestic Site Explorer or BuzzSumo’s Backlinks. You can measure social shares by looking for a share counter on the post itself, or entering the post URL into a service like BuzzSumo to see a detailed breakdown with their Most Shared feature. It might not be a complete audit, but even conducting this limited level of assessment will give you plenty of actionable data on areas where your competitors are currently outperforming your site. What works for them? Can you improve on it in some way (the Skyscraper Technique is a fabulous way to bring in oodles of traffic)? Which sites are linking to them that might potentially link to you if approached with a powerful piece of content or a fantastic guest post idea? Another way to expand your content audit is to include your off-site content assets (if they’re relevant to your audit goals). For example, if you’re assessing the effectiveness of your content marketing efforts, you’ll want to include as much data as possible on any infographics, slide decks, or other external content pieces you’ve released to promote brand recognition and viral sharing. Again, your ability to track the metrics listed above on these content pieces will vary based on the sites hosting them. Gather what you can, but also look for other types of data that are unique to external content sources. As an example, looking at your Google Analytics account should show you the number of visits that each external piece sent to your site. Comparing referred visits across external content pieces can be a great way to determine the direction of your next big content release. Check out Reporting > Acquisition > Channels for a general breakdown of traffic by organic, direct, referral, and social (and select Referrals if you want to see the specific points of origin). And if you utilize custom URLs with UTM parameters, for example, you can instantly see what content is sending the most traffic your way from offsite. In addition to assessing your offsite content pieces, you can apply the audit process to your other marketing channels. If you run print ads in trade publications, try to determine how many inquiries you’ve received from each ad (hint – this is easiest to do if you record the source of your first touch with a new prospect in your CRM after your first conversation). Or take a close look at your e-mail marketing campaigns. Is the content in your autoresponders still up-to-date? Do you have some messages that have a higher open rate than others? Services like MailChimp and AWeber have robust analytics at the ready. When it comes down to it, a content audit isn’t just a one-off process that you conduct once in a blue moon. It’s a mindset that you should apply to both your website content and the other marketing channels you use. By carefully inventorying your existing content pieces and assessing the data you’ve gathered for each item, you can make informed marketing decisions that will help you to save time, cut costs, grow your brand, and improve your overall advertising ROI. And remember, there is no one-size-fits-all solution here. Content audits can take many shapes, routes, approaches, and scopes. It all depends on your needs and your goals. What content audit tools do you use to make it go a bit smoother? What insights did your last audit reveal?